Another sort of internal debate day for me.. I figured I would just stamp something on my nails.. but, I really hate nail stamping. The only successful stamp I usually get is my sweet baby snakeskin, and I did that already.. and I didn't like any of the hundreds of possibilities I have via plates. What to do? I looked in the drawer where I keep all my plates, stamping gear, and nail "stuff" aka rhinestones, studs, etc. My ex-co-worker's daughter-in-law bought a wealth of supplies that she really didn't have any use for - she got them for a really good deal and then asked her mother-in-law to ask me if I would be interested in the stuff.. I figured why not.. I have people that ask me to do their nails from time to time that like having extra activity on their nails - it is good to have kicking around. Anyways, back on track.. I looked at the items, and saw these adorable little butterfly appliques.. When would I ever use them? Hey. Why not use them for 'delicate print' day? 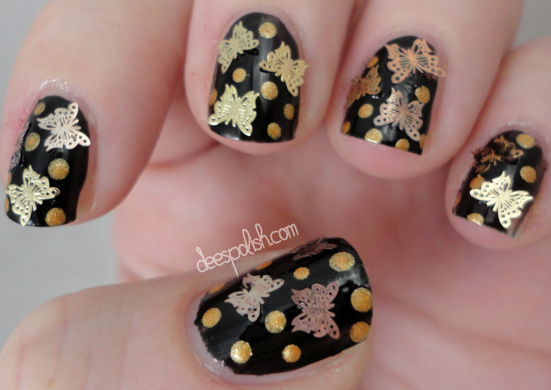 Butterflies are delicate.. these are gold and rose gold.. why not paint my nail black, toss on some of these bad boys, and toss some gold dots around them? Now that is delicate.. right?! I can't even lie.. I am kind of pleased with myself on these nails. I think they are adorable and delicate.. I mean, as delicate as I can be, really. I also didn't add a top coat - I liked the whimsical feel of the butterflies not being sucked right against my nails. Based my nails with Orly Liquid Vinyl, tossed on the butterflies using some Color Club clear coat, and dotted the rest of the open space using Orly Glitz. That is all for today - see you back again tomorrow! !